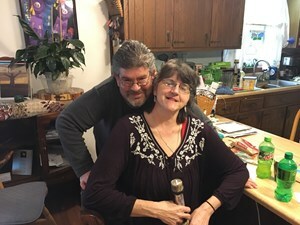 Brian K. Hancock , 48, of Muldraugh, Kentucky, passed away on Thursday, April 11, 2019. He was born on January 1, 1971 in Louisville, Kentucky. Brian enjoyed cooking, family, chatting, and his pets. He had a heart of gold and a gentle soul. He is preceded in death by his Grandparents, Jack and Edna Jackson, and Hazel and William Hancock. Brian is survived by his loving Wife of 20 years, Leslie Hancock, Mother, Donette Marie Hancock, Father, Keith (Susan) Edward Hancock, Aunt, Yvonne Lee, Sons, Joshua and Thomas Douglas, Sister, Barbie Zwanzig, Granddaughter, Justice Berry, and a host of extended family and friends. Visitation will be from 4:00 pm to 8:00 pm on Tuesday, April 16, 2019 at Newcomer Cremations, Funerals & Receptions - Southwest Louisville Chapel, (10304 Dixie Hwy). His Funeral Service will be at 1:00 pm on Wednesday, at the funeral home with burial to follow at Louisville Memorial Gardens West. The family requests that contributions in Brian ’s memory be made to The American Heart Foundation and The American Cancer Society. To leave a special message for the family, please click, "Share Memories." Add your memories to the guest book of Brian Hancock. Brian of all.the fun we had. We wanted to get the catering started. I miss you so much. My Brother you will always be my Brother until we meet again in the Heaven Above. Brian at least you are pain free at last. What a wonderful and gentle soul. I will never be able to thank him enough for love and care that he gave to my step-father Lee Tillman during the last years of his life. Brian was so kind to put up with Lee's brass attitude and became like a member of our family. Having him also be a part of my wedding in Gatlinburg was just another selfless act of kindness. He was there to assist with Lee and also support my mother as she walked me down the aisle. Brian will be missed by his friends that became family.